Looking for a bidet that has all the advanced high-tech features? Who wouldn’t enjoy a very own luxury bathroom? 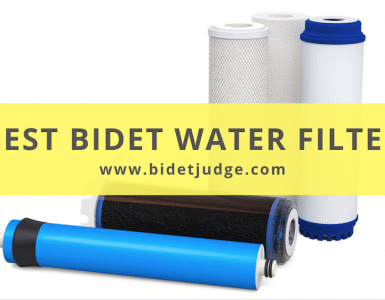 Bidets have become a necessity in today’s world because of its ease of use. Moreover, it has so many hygienic reasons that even doctors recommend it. Personal hygiene is really important for all of us. We have listed down for you the best luxury bidets that will make your bathroom look like a 5-star hotel bathroom. So, it’s time to upgrade and transform your toilet! This article will help you choose the best luxury bidet according to your preference and need. The common features of a luxury bidet? What would you expect in a luxury bidet? Firstly, you need to know everything that a luxury bidet has. A luxury bidet offers many advantages and comfort to you, depending on the model and the features you insist on. 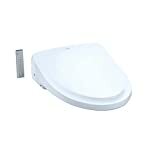 It is an electronic bidet seat having high durability and quality. The luxury bidet seats are ergonomically designed and built to perform for a lifetime. All you have to do is plug the electrical unit into your bathroom’s wall socket. Luxury bidet comes with a heated seat option which means you no longer have to sit on your cold toilets seats in chilly weather. There is an option of controlling the water temperature and pressure that is most comfortable for you. You have easy access to fresh cold and warm water when using a luxury bidet. A great feature of a luxury bidet is that it comes with a remote control with clear instruction buttons that is useful for all age groups. It also comes with auto energy saving modes to reduce the power usage by turning off the seat when not in use. It has a self-diagnostic function where the control panel LED flashes when a fault is detected to warn the user. A luxury bidet has the newest wide spray technology with 3 adjustable levels of cleansing that go well with your personal needs. It has a warm air dryer which dries you after washing so you don’t toilet paper at all. The nozzles have the self-cleaning property to avoid the buildup of germs and bacteria. The ball filter made of silver ceramic consists of naturally sterilizing elements that make sure that the water used for bidet cleaning is uncontaminated and pure! It has a deodorizer that works just an air freshener spray eliminating the unwanted odor. A luxury bidet will definitely improve the look of your toilet. 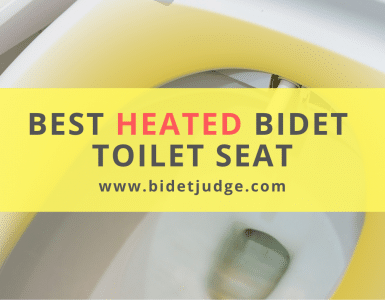 Here is the list of best luxury bidet toilet seat reviews that you can buy to improve your personal hygiene habits. This TOTO WASHLET S300e Elongated Electric Bidet Seat delivers luxury and very comfortable for you to use due to its elongated heated bidet seat having a sleek slim design. The most advanced feature of this luxury bidet toilet seat is the EWATER+ system that uses the electrolyzed water produced by a technologically advanced process converting water into a safe compound. This water helps clean the toilet bowl and decrease waste after each use. You don’t need to buy those harsh toilet cleaners. This EWATER+ technology keeps the toilet bowl hygienic without using harsh toilet cleaning chemicals. This water also rinses the wand before and after use and provides you with a toilet seat that is free from germs or any bacteria. This TOTO S300 provides you extremely clean feeling. The heated come with temperature control options. It is available in cotton white and beige color. The product dimensions are 20.8 x 15.3 x 3.9 inches and weighing 13.5 pounds. 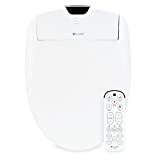 S300 bidet toilet seat is fully automatic which includes a wireless remote control with 5 spray settings and instant water heating option giving you immediate comfort. There is an endless supply of warm water because of its instant warm water tankless system. You will never run out of the warm water if you have this S300e luxury bidet seat in your toilet. Another innovative feature of this TOTO S300 is the Air-in Wonder wave technology. This provides a strong but gentle jet of water spray. The water is injected with air to expand the droplets and produce a better cleanse without being too hard. Water is sprayed at different speeds which allow the small droplets to bump in the larger water droplets to fill in the air. This advanced technology enhances the overall cleaning experience. The premist technique also prevents the waste from adhering to the toilet bowl. Furthermore, it comes with a warm air dryer and deodorizer for a more pleasant experience. TOTO S300 has all the premium features of a luxury bidet that give you the best hands-free cleaning experience. This luxury bidet toilet seat by TOTO also has a variety of useful features for you. As you know, TOTO washlet is one of the best Japanese bidets. It is a combination of technology and luxury. The product dimensions are 20.7 x 15.1 x 5 inches and weighing 16.3 pounds. It has an elongate shape and available in cotton white color with classic style. It provides warm aerated frontal and rear wash that is adjustable to 5 different levels according to your needs. The S550e offers outstanding luxury with a lid that opens and closes automatically. The automatic lid is opened and closed with proximity sensor or you can open/close with the help of wireless remote control. A new feature of this TOTO S500e is the convenient illuminating LED nightlight which makes your night trips to toilets easy without disturbing others. The bidet toilet seat has a white LED light that flashes for night use. The dual side remote control is very user-friendly, easy to operate by all and comes with a wall bracket. The front side of the remote control has all the touch-sensitive basic operations buttons while the back side has advanced settings and tuning options. The S550e uses a constant water heating system without a tank and produces an unlimited supply of warm water for washing. Its instant water heater system can generate and maintain the temperature of water up to 104 degrees immediately. It is also equipped with a warm air dryer and an automatic deodorizer. Moreover, you can take advantage of the pulsating and oscillating spray patterns for highest comfort. Its EWATER+ system uses the electrolyzed water produced by a technologically advanced process converting water into a safe compound. It befogs your toilet bowl between use with this electrolyzed water that helps disinfect and avoid germ buildup. Furthermore, the nozzles are cleaned before and after use with eWater+ to ensure that a clean wash is provided to you. The premist feature also wets the toilet bowl before use. It comes with a one-year limited warranty. The TOTO S500e is particularly designed to offer the most advanced and exclusive features of a luxury bidet. 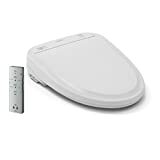 This luxury bidet toilet seat by Brondell is perfect for people who want an advanced bidet product with is not expensive and have all the essential hi-tech features. It comes with a wireless remote control having 3 AAA batteries that have clear labels for all remote buttons. The product dimensions are 19.4 x 15 x 5.7 inches and weighing 13.2 pounds having an elongated shape and white color. The remote is clearly labeled and rests in a holder separate from your toilet. Using the easy remote, water temperature and pressure can be adjusted. There are also clear buttons for front and rear wash and three buttons for 3 levels to set the temperature of your toilet seat. It is very convenient to use as you just click a button on remote and your desired thing is done. It has dual stainless steel adjustable nozzles with a wide spray option that are more hygienic and durable than the plastic nozzle. Nozzle position can be adjusted to 5 different levels while water temperature and pressure to 3 different levels. There is an automated Eco Mode that saves power by reducing the seat temperature automatically. With a dedicated Nozzle Cleaning feature and button, clearing the nozzle is easy. The nozzles are sterilized using Nano silver to provide complete hygienic cleaning. It comes with a 3-year warranty from Brondell. 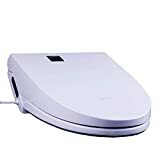 Its best features are that is has a warm air dryer to dry yourself completely without using toilet paper and a deodorizer which eliminate the bad odors. It provides you with instant and continuous warm water due to its ceramic made heating system and no water reservoir tank is required. Its heated seat means that you can say bye those cold seat shivers now. This means that you won’t run of hot water for cleaning. This Swash S1000 bidet seat is beneficial for the old age and people suffering from weakening diseases like arthritis as a hands-free bathroom experience can restore their independence and dignity. 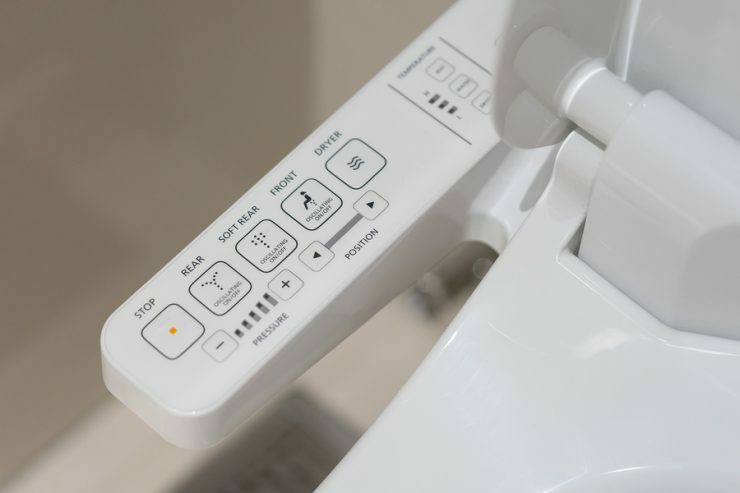 The intuitive and user-friendly controls of this bidet seat are also great for children. All these features make it a very convenient and easy-to-use luxury bidet toilet seat giving you a clean and refreshed feeling. This user-friendly luxury bidet toilet seat comes from more than two years of research, design, and testing. The Brondell Swash 1400 is the most advanced bidet seat with a new design, high-quality components, and cutting-edge technology. The dimensions of Swash 1400 are 20.4 x 15.2 x 5.8 inches and weighing 14.3 pounds with an elongated shape. It is available in white color having a sleek design made of stainless steel. It has a heated seat and provides warm water washing with temperature, pressure, and adjustability of the nozzle position. The seat and lid have gentle-closing. The nozzle of the bidet is also sterilized through silver nanotechnology which rinses the nozzles clean. It offers fully customizable settings according to you. Two retractable and self-cleaning wands are used, one for backwashing and one for feminine washing. The separate frontal and rear wash nozzles make sure to provide you a hygienic wash. The Swash 1400 has a thick lid which supports your weight too. It is also equipped with warm air dryer that has adjustable 4 levels of temperature and helpful for everyone especially people with mobility issues and giving you totally “hands-free” experience. No bad odor anymore! It has a deodorizer which is replaceable having carbon filter which also cleans the air along with masking the bad odors. Another good thing about this Swash 1400 bidet is that all functions are operated easily by pressing a separate button for everything on a wireless remote control. This product is definitely loaded with features as Swash 1400 has an automatic eco mode which helps in conserving energy and a cool blue illuminating nightlight making your night trips to the bathroom very convenient. Brondell gives 3-year limited warranty on this bidet product. If you want a premier class bidet for your toilet, then Biobidet Bliss BB2000 is the answer. Bliss BB2000 is an advanced luxury bidet toilet seat with the best cleaning features. It is very well designed and offers high quality that ensures a long life. This is a fusion model so it’s all your choice to use the premium functions of the bidet or the regular toilet functions. The product dimensions are 21 x 15.6 x 9 inches and weigh 16.4 pounds. What’s unique about this luxury bidet? Almost all bidet seats come with dual nozzles but BB2000 has a 3 in 1 nozzle. This system is used for signature vortex water stream, brilliant posterior and gentle feminine wash using the bubble infusion aerated technology. The vortex water steam uses the maximum volume of water for maximum cleaning experience. The 3 in 1 system is more reliable and effective than 2 in 1 or 1 nozzle wash options. It also comes with a U-Pick wireless remote control in black and white color for your convenience. It has a powerful heating seat with adjustable temperature equipped with intelligent body sensors. The bliss BB2000 also has a warm air dry to eliminate the toilet paper usage. The user can enjoy the oscillating wide clean and pulsating message cleaning as well. It is very eco-friendly having an energy saving mode which conserves energy to reduce your bills. Another breakthrough of this bliss BB200O0 is its hybrid water heating technology. This innovation is one of the most effective, useful and reliable instantaneous water heating methods which combine the water flow and temperature resistance with unlimited duration to create a continuous warm and regenerating water flow. To make sure that nozzles stay ultra clean, they are made of stainless steel, motor-driven and patent pending Hydro-Flush technology cleans the nozzle inside-out to provide maximum hygiene. The CleanSurge rapid self-cleaning is another advanced feature of this bidet which cleans the nozzle with just one touch. It has a nightlight LED mode for trouble-free night trips to your toilets. Bliss BB2000 comes with a 3-year warranty. Want to know more about this product? Please check our in-depth review for Bio Bidet Bliss BB2000. This luxury bidet is a high-tech advanced flush bidet toilet combo that gives you extra comfort. It is a combination of luxury and economy having elongated front toilet bowl. It is a dual flush toilet with soft closing lid and a heated seat that is temperature control. The skirted design with high profile tank makes it a good choice for those who want to a dual flush toilet. It comes with a double cyclone flushing system and provides an automatic hands-free flush that is suitable for all ages. You can also enjoy features like the oscillating and pulsating massage. In addition, the 700H comes with a remote control to allow you to control and adjust the water temperature and pressure settings. The toilet bowl is made of SanaGloss, which makes it smooth and creates an ion-barrier so that the bowl stays cleaner for a long time. This luxury flush toilet uses the eWater+ technology for maximum hygiene and cleanliness. Plus, the warm air dryer will make you dry in less than a minute after washing leaving you refreshed. It also has a nightlight illuminating feature for night safety. The air deodorizer eliminates all undesired odor for your bathroom. The Euroto Smart Toilet is exactly the intelligent toilet bidet that you need for peak comfort and effective hygiene. Since the Euroto strives to give you premium comfort, it features a heated seat which helps folks living in colder areas. There are several modes for washing including a separate one for men and women. Although other settings such as massage wash and pulsating wash are present, you can modify them according to your comfort. These modes help promote efficient blood circulation as well. Also included are sensors that detect when you’re near or far. It then proceeds to open the lid or close it accordingly. The auto-flush toilet uses a sensor as well to detect when you get up. You can even adjust the intensity and the temperature of the air dryer to allow for a more customized experience. The control panel can easily be stuck on the wall. It is quite durable and protects itself from any humidity. The built-in water filter also ensures that no hard water can build up scales in your toilet bowl. Let’s not forget the expert craftsmanship that went into building each model. The toilet is made of high-grade polypropylene which is much more immune to any cracks or damage. The bidet wand cleans itself after each use. The included built-in carbon filter helps eliminate any unwanted odors. The Euroto Luxury Smart toilet is perhaps the best luxury bidet which is durable and sturdy as well. Constructed from High-grade premium materials. Adjustable temperature and flow of all features. Automatic features such as flushing and lid opening/closing. Various spray types that can be easily modified. A full flush is not as powerful as it should be. These bidets are the luxury and comfort you don’t want to live without. We recommend you buy the best luxury bidet for the finest possible experience. This would significantly reduce your yearly toilet paper expenses while improving your personal hygiene. So choose the best luxury bidet for your toilet to give it a lavish look while you enjoy the benefits of refreshed clean feeling after every wash. Once you start using a luxury bidet, you will never want a bathroom without it. It’s a completely new experience of a healthy lifestyle.